Celebrating over 60 years of service and family tradition! more... click here for celebration detail. The trade mark of Rainsville Church Pew Company is quality. We adhere to the tradition of excellence started years ago by our founder the late Ted Johnson. He took pride in crafting fine furniture, pieces worthy of belonging in a house of worship. 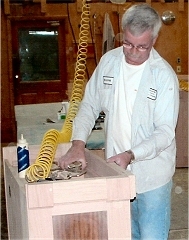 His hand-crafted pews were fashioned from rich hardwoods into beautiful, functional, durable designs. Today, our company continues the tradition begun so many years ago. We are still family owned and operated. We still take pride in the quality of the products we produce and in the God-given talent to create them. Our complete service includes planning, manufacturing and installation of your furnishings. We urge you to take full advantage of our experienced representative's understanding of your building program and your congregation's unique needs. Consultation with our staff comes at no additional cost or obligation to you. Rainsville Church Pew has provided quality church furniture since our founding in 1958. It is our mission to provide the highest quality church furnishing. We believe the best way to achieve this goal is to first understand your unique requirements and objectives.